State of E-Commerce in India: online user base grows 50% YoY! India’s online population grew by over 50% in July 2012 as compared to July 2011, according to a joint study by Internet analytics and audience measurement company comScore and trade association ASSOCHAM. 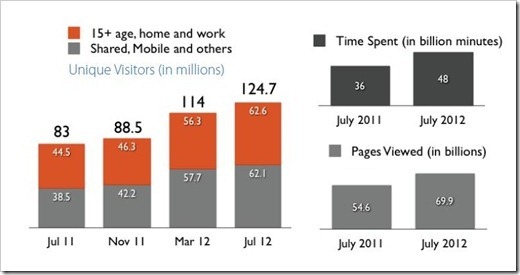 According to the State of e-Commerce in India report, there were 124.7 million or 12.5 crore unique visitors in July 2012 out of which nearly 50% were visitors from home or work. The other half accessed internet via mobile or shared networks. A total of 48 billion minutes were spent online. 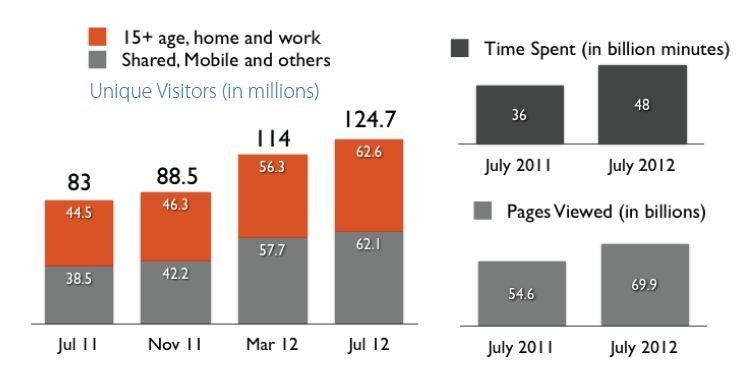 In a recent study, also by comScore, most online minutes in India were spent on Google sites, Facebook and Yahoo. Insight into the demographics of the online Indian audience revealed that 45.6% of all the internet users were males between 15 and 34 years of age. Females aged 15 to 34 made up 29% of the Indian online population. Together, males and females in the age group 15 to 34 years made up 75% of all the internet users in India in July 2012. "India is one of the youngest online demographic globally. This is expected to be a continuing trend in coming years, given the age distribution in India" said the report. The largest subset of the online Indian population was males and females aged between 25 to 34 years, making up 39% of the total online audience. State of e-Commerce in India report also revealed insights into key e-commerce segments including Travel and Retail. In the Travel domain, state owned Indian Railways’ was the most visited website as it reached out to 19.2% of the online audience. IR recently launched RailRadar, an online application that allows users to track trains in real time. NASDAQ listed Makemytrip.com, Salman Khan promoted Yatra.com and Cleartrip.com were the leading Online Travel Agents (OTA), reaching out to 11.6%, 8.3% and 3% of online users respectively. "Airline, OTAs and hotels have seen steady growth and will remain as standard travel options for many consumers in the coming months" said the report. Among Indian e-tailers, Flipkart.com was the most visited website with an 11.5% outreach to online users. 7.4 million or 74 lakh users found their way to Flipkart.com in a single month and average transaction size was $35 or approximately Rs. 1,855 at current rates. Snapdeal.com had a marginally lower outreach of 11.1% and audience on 6.9 million or 69 lakh users in a month. Lifestyle shopping portals Jabong.com and Myntra.com had similar levels of traffic as both websites garnered 5.3 million or 53 lakh unique visitors during the month. The fastest growing segment in the online retail market was Apparel followed by Consumer Goods, Sports/Outdoors and Home Furnishing. E-commerce in India is said to have shown a growth that is much higher than other online segments. comScore and ASSOCHAM expect social commerce, broadly defined as e-commerce involving use of social media, to play a vital role in the coming years as social media becomes a prominent marketing channel for online retail. "Internet is getting into the daily life of most people and mobile internet will drive the growth of e-Commerce, Banking, Education, Healthcare and Entertainment in the near future" said Milind Deora, Minister of State for Communications and IT. 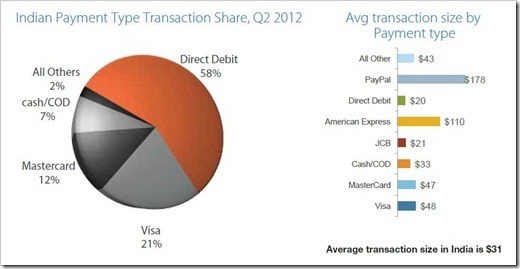 Across the Travel and Retail e-commerce domains, the average transaction value during the quarter April to June 2012 was $31 or approximately Rs. 1660. On the most visited IR portal IRCTC, SBI was most preferred bank for direct debit followed by ICICI and HDFC. As of July 2012 there were 1.5 billion internet users worldwide. Since July 2011 the online population in the Asia Pacific region grew nearly 7.5% from 574 million to 617 million. Europe’s online population grew 7.8% to 399 million while the number of online North Americans increased 3.4% to 213 million. Latin America and Middle East & Africa had the highest percentile growth in online population but in absolute numbers the regions had 134 million internet users each. "The online user growth has primarily been fueled with improved network infrastructure and growing need of online content consumption" said the report. Even in India consumption of online content has witnessed double digit quarter-on-quarter growth in Q1 and Q2 2012. In the entire report I did not see eBay being mentioned when eBay is much more in use compared to Amazon when we talk about Indian e commerce markets. Itna gussa kyun hai bhai ????? I remember, there was a time, when flipkart reported new about 60% of customers are demanding COD, and current scenario is completely different! I am happy to see that..! Well, one another thing I want to ask is…! The same stats would have achieved if there was no Angel Funding? Because a talk of the town is, many of eCommerce site is operating only because of huge direct discounts or discount coupons..! Good Initiative at the end… It was done in all the developed countries earlier in order to release more spectrum and effectively use them. All the broadcasting companies, Users and Government will get full benefit out of it due to efficient and effective use of spectrums.